Colorado National Monument, near the city of Grand Junction, CO, USA has one of the grand landscapes of the American West within a vast plateau and canyon panorama. 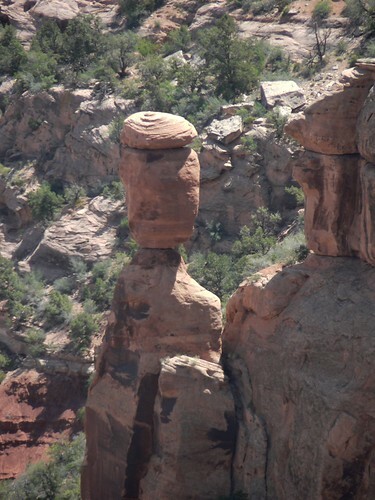 Amongst several towering monoliths there is this large perched rock precariously balanced on its base! No details are available about this rock. I am also unaware if it has been given a name or not. Credits: I am thankful to anonymous for informing me about this amazingly balanced rock. Thank you 'anonymous' whoever you are. I wish you had left your name in the comment sent by you so that I could have given credit to the right person.